¶ 1 Leave a comment on paragraph 1 0 Imagine you have just landed in the city of Frankfurt, the New York of medieval Germany. Travel south (‘push’ the map up) through Darmstadt to Mannheim, and then to what is now Karlsruhe. Turn east towards Pforzheim. Now is a good time to switch to ‘Satellite’ view. Pforzheim is situated right at the northeast corner of the Black Forest. Now follow the eastern slope of the Black Forest south. You will be passing the sites of former Jewish communities in “Weil der Stadt,” Horb, Sulz, and Rottweil. Once you see Waldshut-Tiengen, it is time to zoom in and track back. Some fifteen kilometres northeast of Tiengen, in the Wutach Valley, lies the little historic town of Stühlingen. You might have missed it without magnification. Just for fun switch back to the map-view. Now you see that Stühlingen sits flush at the border to Switzerland, right across from Schleitheim. You will meet it again later in the story. You have just travelled one of the major north–south medieval trade routes. ¶ 2 Leave a comment on paragraph 2 0 From the sixteenth to the middle of the eighteenth century, the town of Stühlingen and its surroundings were home to a flourishing Jewish community, which was finally expelled in 1743. According to legend, the evicted Jews of Stühlingen were among the early Jews in Endingen, Lengnau, Gailingen, Randegg, and Tiengen. The first two communities formed the early core of Swiss Jewry. ¶ 5 Leave a comment on paragraph 5 0 For reasons of convenience, by the seventeenth century most houses provided direct access to their extramural backyards, thus breaching the security of the town wall. 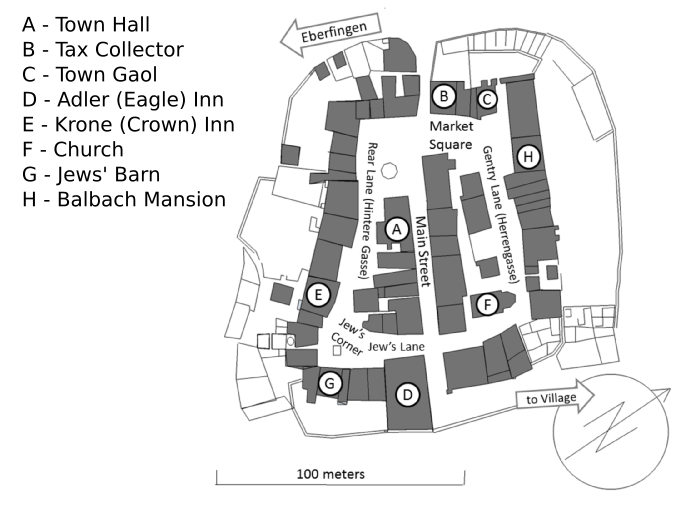 The outermost boundaries shown in the town plan representing seventeenth-century Stühlingen (fig. 2) are mere retaining partitions shoring up the garden plots. 1Brandeck, Geschichte der Stadt, 143.